Имате въпрос към Hanoi Focus Hotel? Разположен на централно място в Стар квартал, Hanoi Focus Hotel е идеално начало за Вашaта екскурзия из Ханой. Хотелът се намира се на 0.0 km от центъра на града, поради което неговите гостите могат безпроблемно да се наслаждават на всички градски атракции. С удобното си местоположение хотелът предлага лесен достъп до всички градски забележителности, които задължително трябва да се видят. Hanoi Focus Hotel предлага безупречно обслужване и необходимите удобства, за да удовлетвори гостите си. Подбор на съоръжения от най-висока класа като 24-часова рецепция, експресно настаняване/напускане, съхраняване на багаж, Wi-Fi връзка в общите части, рум-сървиз, са на разположение за Вас в хотела. Всички стаи се отличават с грижливо замислени удобства, което гарантира неповторимо усещане за комфорт. Освен това в хотела можете да се възползвате от множество предложения за приятно прекарване на свободното време. Насладете се на несравнимото качество на услугите и престижното местоположение на Hanoi Focus Hotel. Not expensive, large room, ask for the backside cause cheaper and no noise from the street. Had a great sleep. Thought i had paid by creditcard but didnot. The girl at the counter was very patiënt with me and right. They arranged a vast and rliable can to the airport, not to expansive. Would recommend this one for sure. There are so many hotels at old quarter. 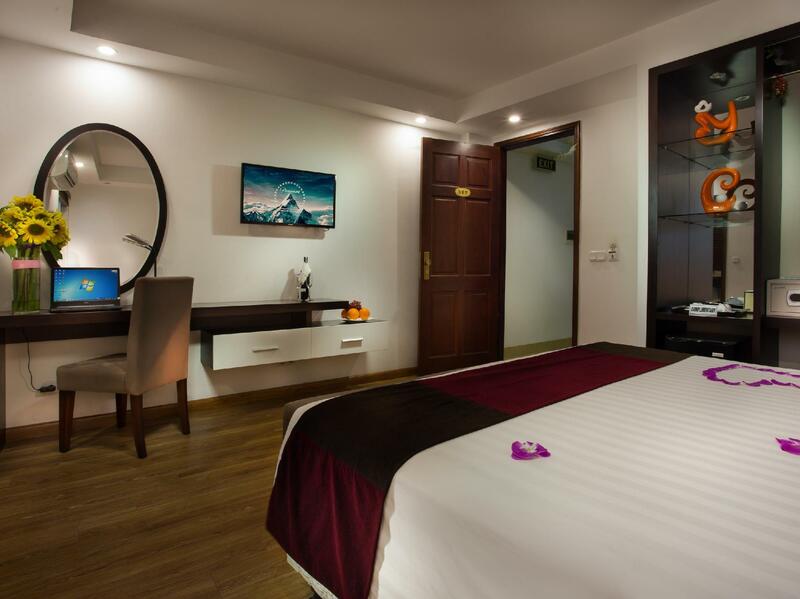 Reason for choosing Focus Hotel is the location is walking distance near Hang Ga Street, Hoam Kiam lake. most importantly they have family room with 3 beds located at 5th floor , which is big and clean. WIFI is good too. Staff is friendly and helpful. walking distance to Vietel shop and we bought the Data Sim card which is cheap too. About Vnd120000 for 1month 3GB Breakfast is average but the staff is extremely helpful and cheerful too. I booked this hotel for two nights. The first night they told me it's fully booked so they transfer me to another hotel which not far away from theirs called Victoria hotel? That one is not very clean. Second night when they moved my back to their hotel, the room is much nicer! I hope this won't happen to other guests again in the future. The location is good enough to walk to the local lake and also restaurants. The reason why I gave 2 stars for the facility is because our room on the first floor next to the stairs was poorly sound proofed. We could hear everything that was going on ground floor kitchen. Other than that the hotel was fantastic! The staff were extremely friendly and they presented us with a farewell gift to apologise for the noisy room. This hotel staffs are very polite and helpful. Envinronment is clean and what you pay for. Location is just nice for you to access to nice restaurant, lake and souveniours shop. They also arrange for airport transport which is only 15usd. Hotel was great overall but one thing at very last I was upset about taxi which was arranged by hotel. I've asked hotel to arrange a taxi to go to airport. It was 16USD. When I got airport, the driver asked me to pay additional 50000 VD as the money he got from hotel was not enough. I showed the receipt from hotel then he asked me to paid toll fee and parking fee. I didn't see the driver paid any fee on the way to airport, so I denied to pay. He kept asking me to pay additional. I told him that I would call hotel. Them he told me that go way. My advice to all traveller to this hotel to check it, then he gave up and told me to go away. Here is an advice from me. Please do not forget to grab a receipt from hotel and make sure at reception you don't need to any additional to the airport. 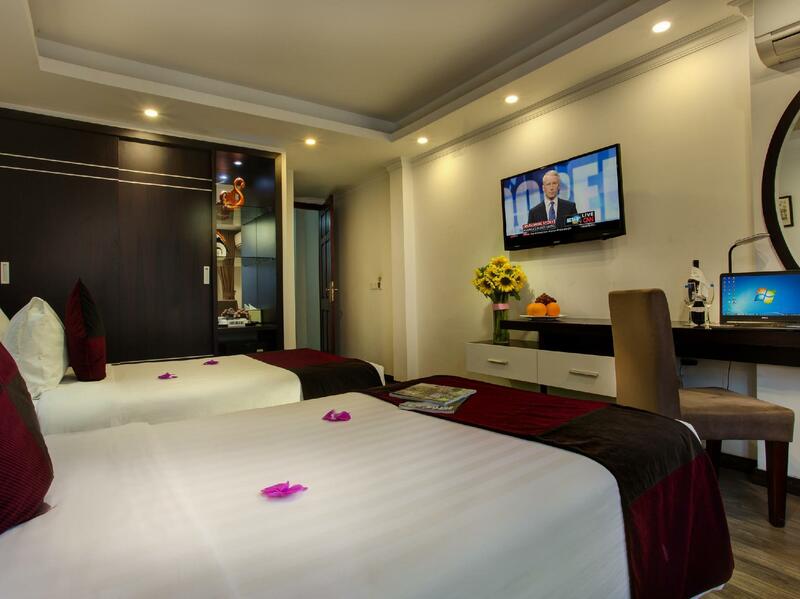 The hotel is situated near Hoan Kiem Lake. Although it is close to The busy street, it is very quiet in The hotel. I definitely recommend this hotel. Good price, good location and very stuff. In addition, breakfast had choices for Bread, pastries,fruit, eggs etc. 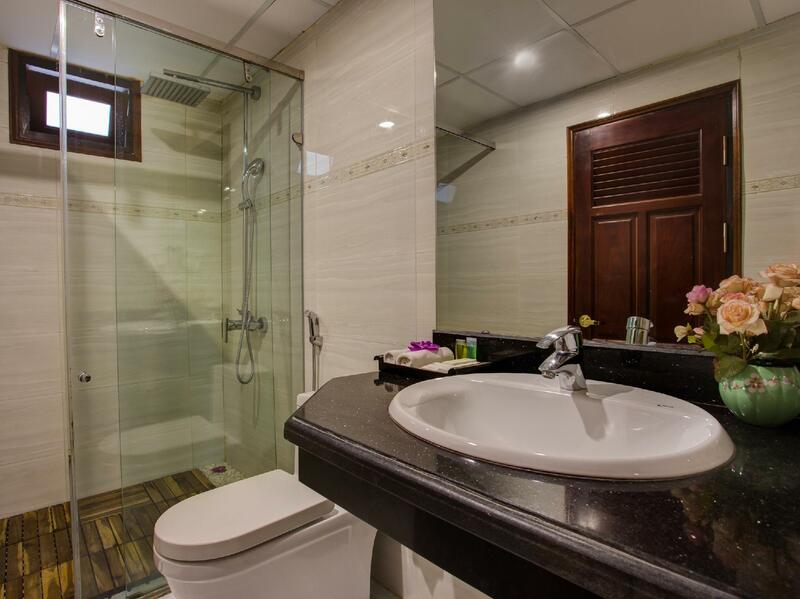 the hotel is located right in the old town of Ha Noi . 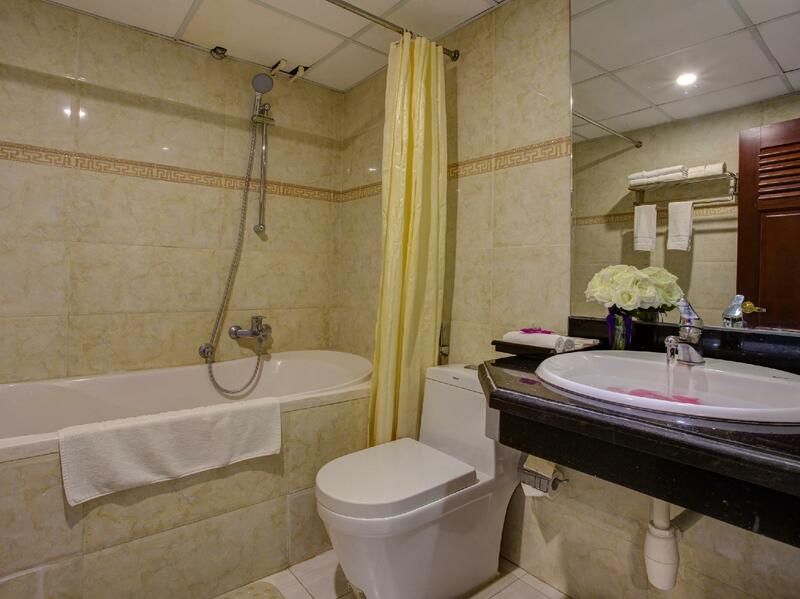 just 3 minutes walk to Hoan Kiem Lake, 8 minutes to Dong Xuan Market . Room is very clean, enthusiastic staff. Breakfast is good. We will be here when coming to Hanoi. Best service in a great location with 3 min walk to Hoan Kiem lake. Front staff Julie was sweet and customer oriented. Brought me a takeout breakfast as I should leave for airport before breakfast starts. Only thing might be improve would be breakfast quality. Very nice place in the Old Quarter near the lake. I had a compact single room which had a window facing a light shaft, no view but at least there was some sunlight. Room was very clean with a nice decor. Breakfast was good with a decent selection. The staff was friendly and helpful. The only negative thing was that the walls are a bit thin, and I could hear the neighbors and the water draining down the pipes. We stayed here twice. Good price for the central location. It's central to everything that you need to walk to in Hanoi. It's also in a quiet street so it's easy to fall asleep without all the car noises. We stayed 3 nights but split with a trip to halong bay (golden lotus cruise, very mice comfortable boat booked by the hotel), so posting the same review twice Hotel is very well located in a quieter street than the main roads but very close to the lake and other attractions/restaurants in old quarter (excellent yoghurt and fresh fruits just at the doorstep of the hotel). Hotel manager Ruby and her team were very pleasant and attentive to our needs, they are clearly trying hars to make their customers happy and get a good reputation. The family room is very comfortable, very spatious, very bright and very clean. we are a family of 5 and more people could fit in, it is actually like 2 bedrooms. Breakfast is good. The only thing is that they should put some double-glazed windows as we can still hear a bit the noise from the street although it is much quieter than the main streets. Hotel is very well located in a quieter street than the main roads but very close to the lake and other attractions/restaurants in old quarter (excellent yoghurt and fresh fruits just at the doorstep of the hotel). Hotel manager Ruby and her team were very pleasant and attentive to our needs, they are clearly trying hars to make their customers happy and get a good reputation. The family room is very comfortable, very spatious, very bright and very clean. we are a family of 5 and more people could fit in, it is actually like 2 bedrooms. Breakfast is good. The only thing is that they should put some double-glazed windows as we can still hear a bit the noise from the street although it is much quieter than the main streets. Great location, friendly staff, clean & comfortable room. A great & comfortable stay. Staff were very helpful & friendly. Hotel location is great, in the heart of old quarter. Walking distance to weekend market & Hoan Kien Lake. Would highly recommend this hotel. 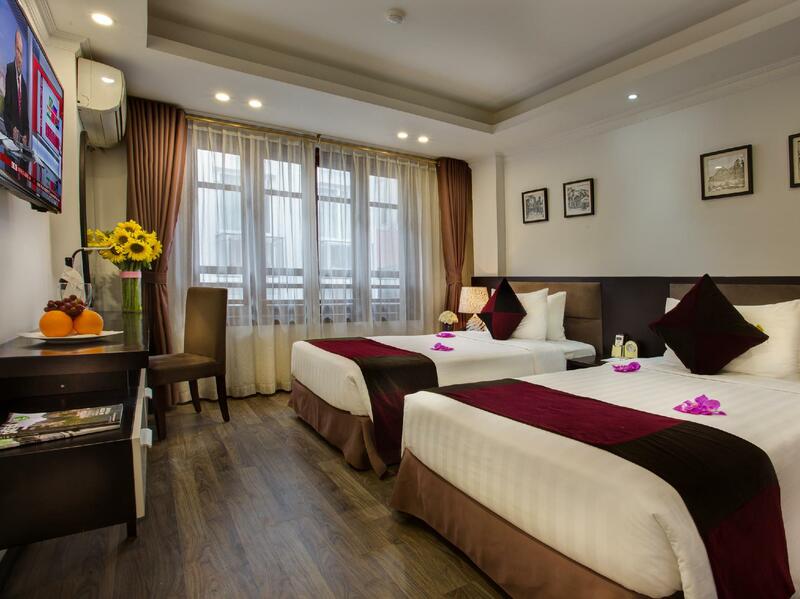 Hanoi Focus Hotel is about a 5 minute walk from the main roundabout at the northern end of Hoan Kiem Lake and right in the thick of all the action in the old town but it is in a quiet side street so you have the advantage of both. The staff there are very helpful and arranged and booked tours for me while I was staying in Hanoi. Great stay here in the family room which had a nice balcony. Staff were very friendly and helpful. Breakfast was fine with good omelets, selection of fruit, breads, cereal and some hot food including soup and noodles. Good location in old quarter, few minutes to the lake and pub street without being on it. We would stay here again. I stayed at the Hanoi Focus for my first 3 nights in Vietnam on my first solo travelling trip. From prior to landing through to the moment I left I cannot fault this hotel and the hospitality of the staff. They couldn't do enough for me to make sure that I was happy and that my stay was a great one. I booked a couple of trips via the hotel which were both organised really well. The trip to Halong Bay was exceptions and even though it was cloudy and rainy I would recommend anyone staying on Hanoi to head out to Halong Bay. Even though I had checked out, they kept my luggage for the trip and offered me a shower and to freshen up before providing a free taxi service to the station. One of the employees even came with me to ensure that I got on the right train cart safely. Absolutely amazing value for money and such accommodating staff. The breakfast was average but this pales into insignificance with the service offered. For anyone new to Hanoi, a lot of hotel rooms don't have windows due to the high cost of land and the architectural design so don't be alarmed if you don't have one. This is common and even though it was raining during my stay I was barely in the room. They are comfortable and very clean. Overall compete satisfaction. Only really used to this level of service in the US which has a significant tipping culture. Highly recommend this hotel. There are precisely two staff workers here, one of whom (listed in other reviews), Ruby, is exceptionally good and on point. The rest range from decent to a little clueless, so try to deal with her if you can. The rooms were reasonably clean, although there are little bits that the cleaning staff miss, to be perfectly honest. The location is good, you're in the crux of the old town, and the staff can help you get a taxi, arrange tours, etc. Breakfast is fair-to-middling, because certain items just disappear and are not replenished, nor do you see them the next day. Kitchen staff can often be seen farting around or flirting with each other instead of actually doing their jobs. Don't expect much at breakfast, that's the main point. Beds are comfy--aircon works well, and the minibar is reasonably priced. Laundry service is decent.